Just like a lot of people, the holidays don’t really kick in for me until the tree is trimmed, presents are wrapped, and the holiday baking commences. A personal favorite are these Chocolate Peppermint Pinwheels or my Quick Bread Cinnamon Rolls. 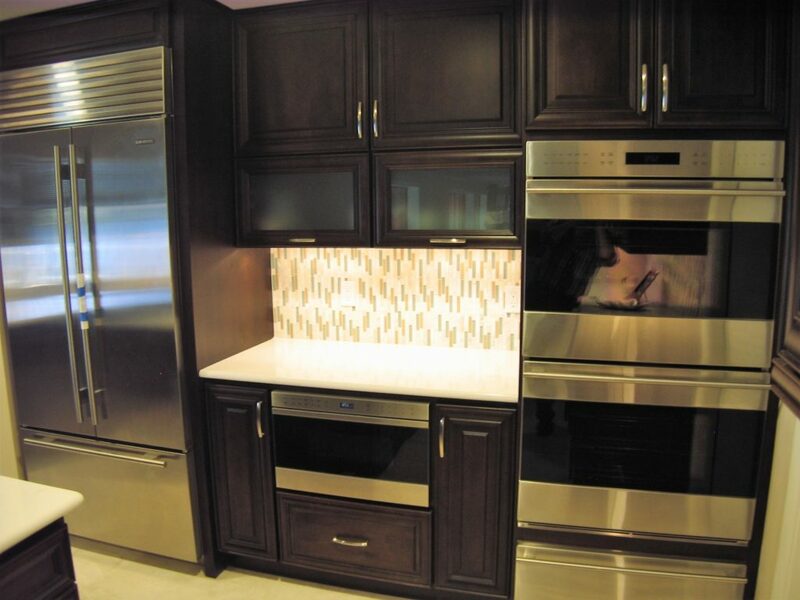 Here are some great accessories to aide you in your baking efforts from StarMark Cabinetry. That huge stand mixer is a definite necessity for batch after batch of cookies but lugging it from one spot to the other can be a pain. What if you could pull it out and put it back with a simple tug? 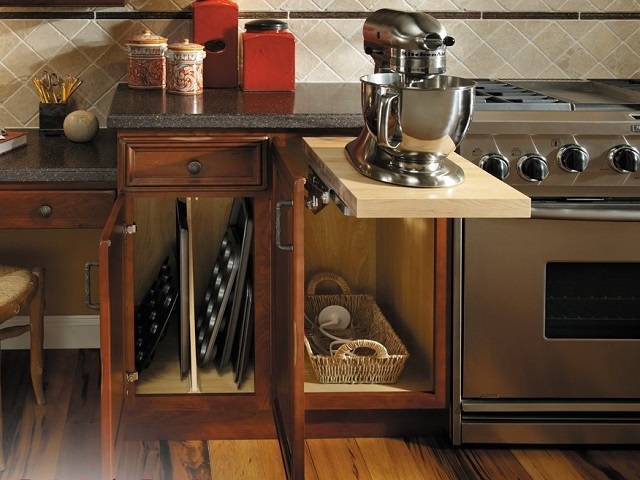 A stand mixer shelf will allow you to pop the trusty workhorse up to counter height, mix away, and then return it to its home with almost no effort at all. Make sure you not only know where everything is, but easy to get to and use. 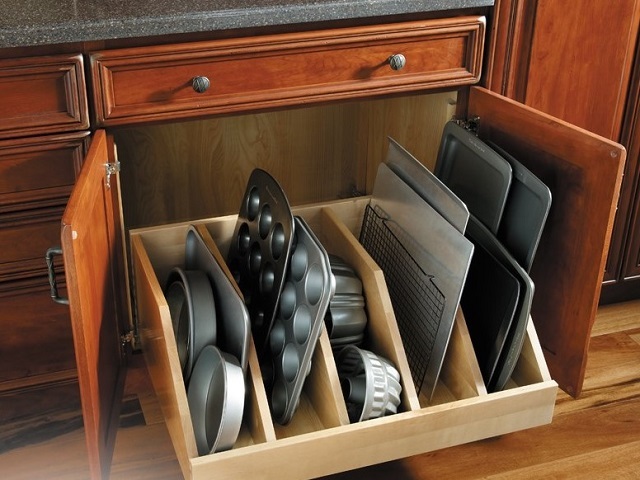 A variety of accessories can do that for you: chrome basket pull outs are great for mixing bowls and casseroles. Wooden roll out trays are also a painless way to fetch your baking dishes in a snap. 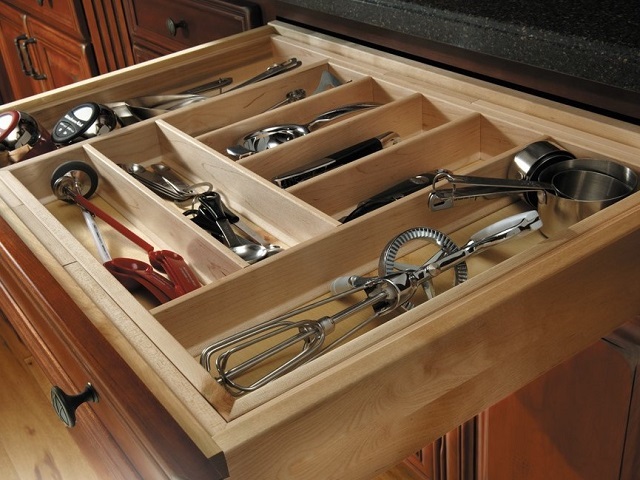 Why not use cutlery inserts to organize all your measuring cups, spoons, graters, and hand beaters? They aren’t just for knives and forks anymore. Your other appliances need a convenient home as well. Food processors, juicers, bread machines, store neatly away in an appliance garage, and a door that opens vertically means nothing is in the way while you put those appliances through their paces. What about those little things that store better when they hang? 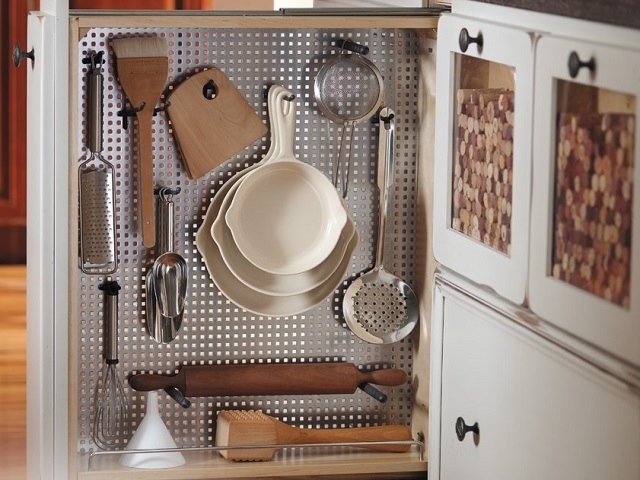 Not every kitchen has room for a peg board – or does it? 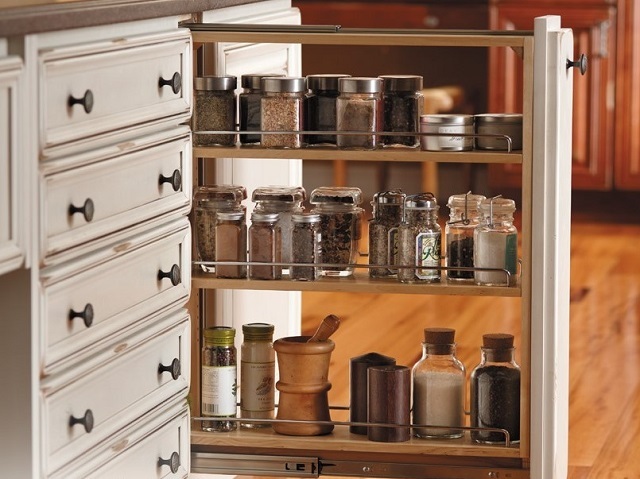 In no more space than spices take up, a peg storage pull out will place it all at your fingertips. Sometimes you don’t want to make multiple trips to the pantry for all your other ingredients. What if you placed a mini-pantry next to your work space? 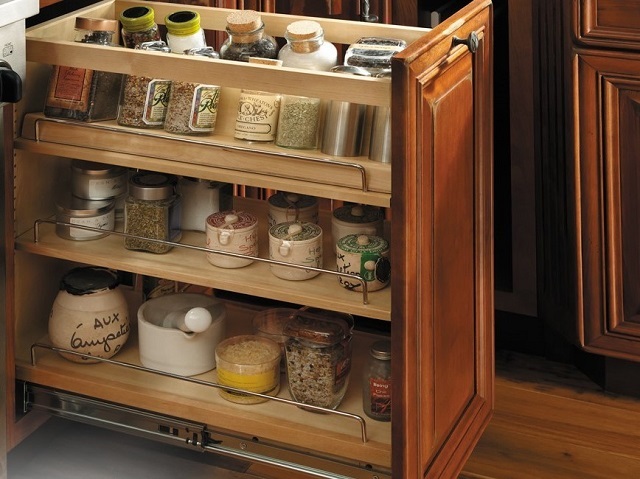 Larger shelves for oils, vinegars, flour, and sugar will always be where you want them. 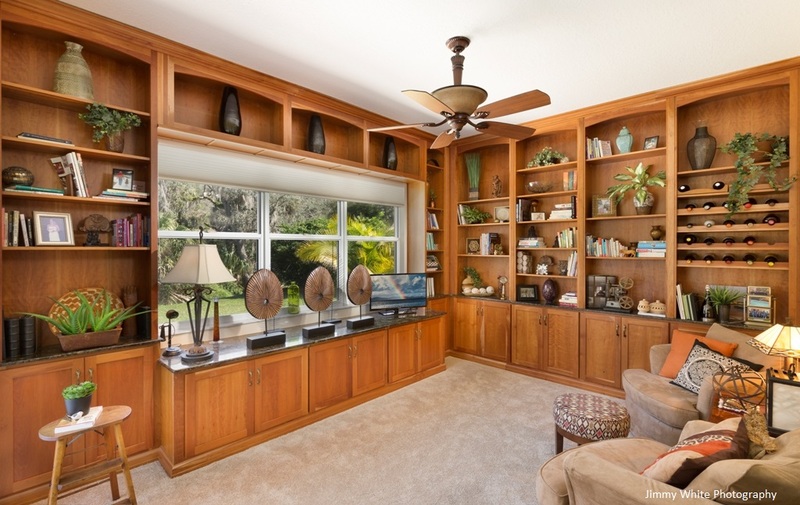 Large items and corner spaces. Both can waste valuable storage capacity – unless you combine them. 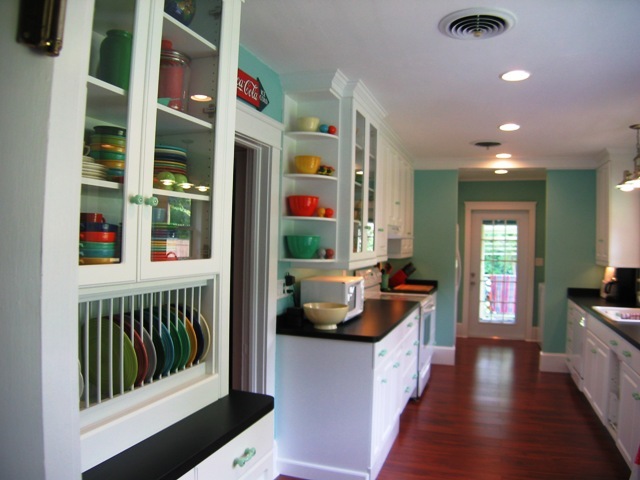 Lazy susan shelves conveniently located in otherwise dead corners maximizes both storage area and ease. Stacking muffin tins, cake pans, cooling racks, and cookie sheets are no longer a pain. 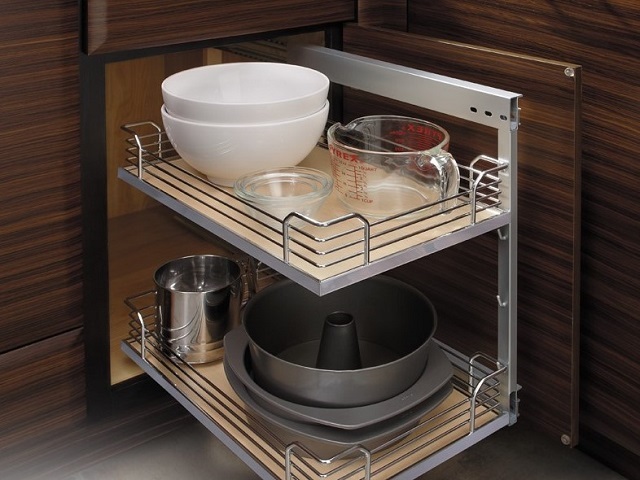 Each has its own compartment, and everything is organized and easy to grab with tray storage roll outs. Out of all of these, I think this is my favorite! 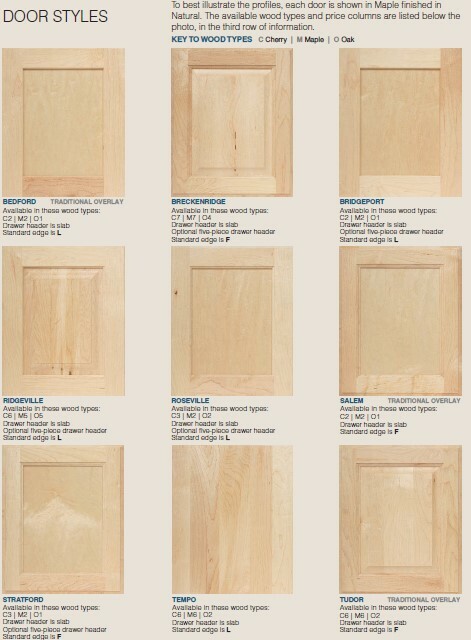 Watch the video to see some of these in action. And if you want to add these great time savers to your new kitchen, drop us a line. Happy Baking! Hearing ‘Florida condo’, you generally envision something in either coastal hues or vibrant tones instead of gray, but these clients wanted something subtle and neutral for their recent purchase. They sold the midwestern homestead, relocated to the sunshine state, and these clients were anxious for something different. 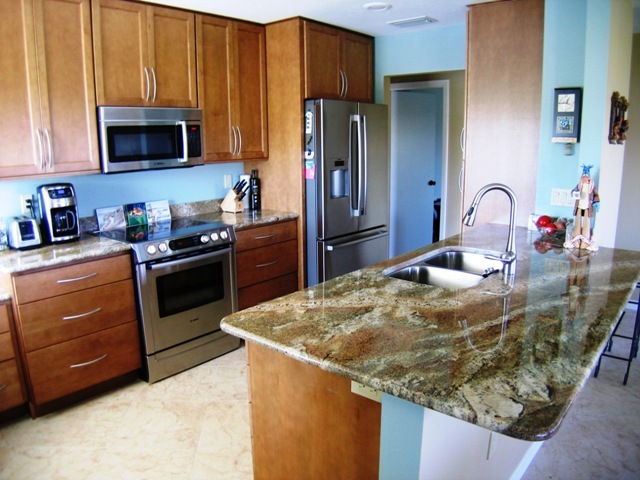 The first-floor condo they purchased for their retirement was in desperate need of an update. Sporting the original décor from 40 years ago was cause for this condo to be taken down to the bare bones and a fresh coat of everything put in its place. 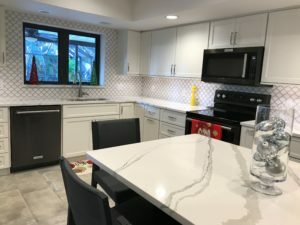 The first thing decided on was neutral tones which were anchored by white shaker style kitchen cabinets and a graywash, embossed vinyl plank floor throughout the unit. 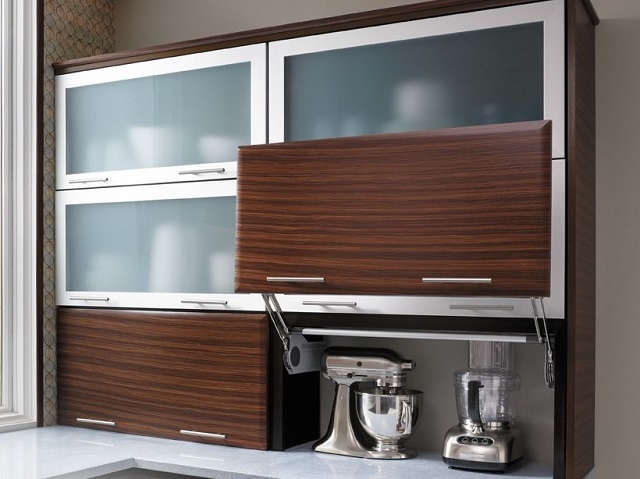 Being a modest condo, the clients settled on the value-conscious, Stressless Cabinetry line. 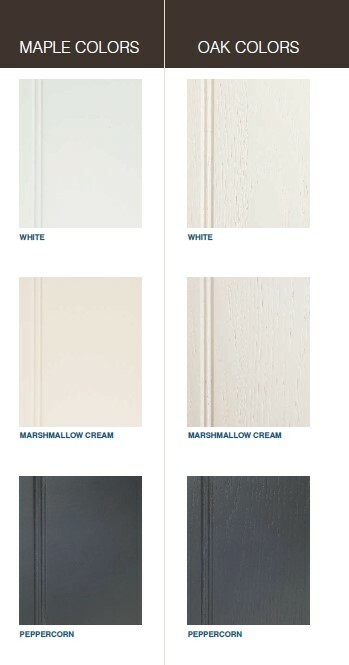 The Retreat door style and Jasmine White paint created the pillar on which to build our understated palette. 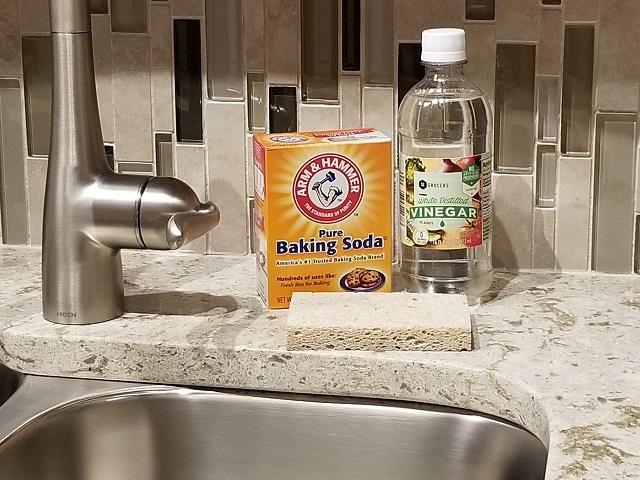 Pairing Bianco Sardos granite allowed the clients to best extend their budget and deliver the durability of stone counters that was important to them at the same time. After all, the speckled black, white, and gray markings added a second layer on our growing gray motif. 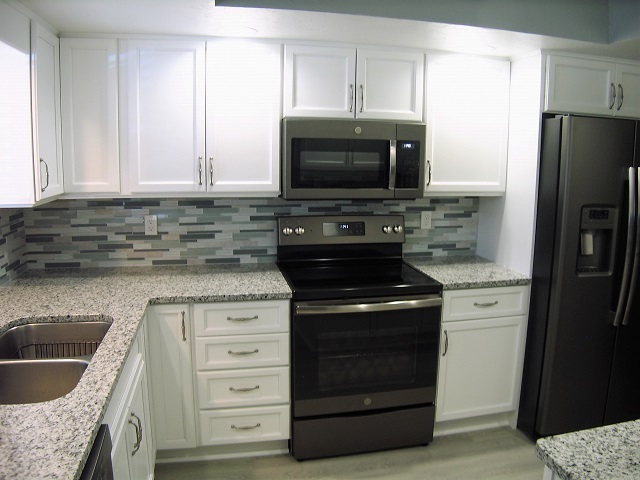 A suite of GE appliances in black stainless steel, multi-colored glass backsplash tile, and 2 different tones of paint rounded out our color wheel. 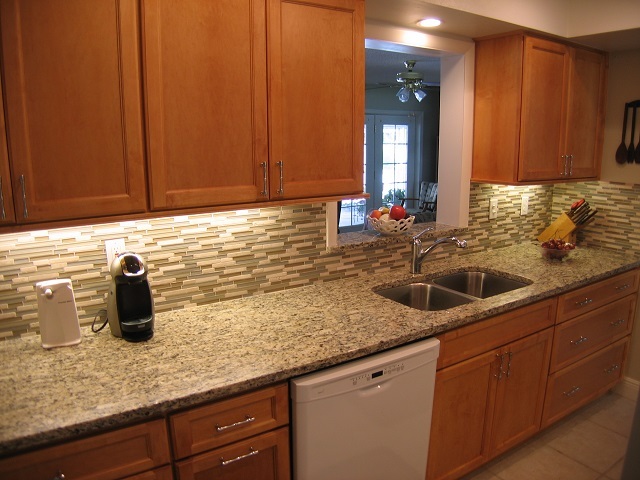 Using a multi-tonal backsplash tile helped create the focal point by virtue of the variety of colors found within it. Unfortunately, the first-floor condo required the retention of the existing soffits to hide necessary mechanical attributes. Selecting a darker gray accent sets off the coffered ceiling while giving it some purpose. Stuffing or dressing? Which do you prefer? I’m strictly a dressing guy myself. Either way you choose, this one has been my go-to recipe forever. 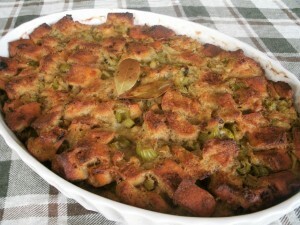 It’s a riff on my mother’s and grandmother’s traditional Thanksgiving stuffing, and (if I do say so myself) it’s pretty darned good. Make no mistake, this is not diet food. THIS is extravagant comfort food, but that’s what the holidays are for, aren’t they? I’ve morphed this over the years from my grandmother’s original concept to make it my own. This Is an herbaceous, earthy accompaniment to just about any holiday entrée. Of course, the traditional Thanksgiving turkey is the most common in our house. 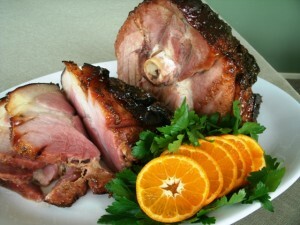 But I’ve paired this dressing with a ham, roast pork, lamb, and beef over the years. Haven’t been disappointed yet. And it’s a great jumping off point to make the dish your own. On more than one occasion, I’ve added sausage, apples, dried fruit, or cooked grains as augments to the dressing. When I was a kid, Mom would add canned oysters. I can promise you, you will never find canned oysters in this dish at my house – not even on a dare. The biggest piece of advice I can give you on this recipe: don’t skimp on the bread. When I was a kid, my grandmother made this with mass-produced sandwich bread. That just doesn’t work. This needs to be a hearty, crusty, chewy loaf of bread. I grab a couple of loaves from the mega-mart bakery department, what they label as an ‘artisan loaf’. Makes all the difference in the world. Trust me. The other piece of advice: don’t try to make this a calorie-friendly recipe. Just don’t. If you want calorie-friendly, either make something else or have a very small portion. It’s the holidays, butter is supposed to be your friend. If you take those two bits of wisdom, the rest is pretty easy. Normally, I buy the bread a few days ahead, cube it, then lay the bread cubes out overnight to dry completely. Once dried, I store them in a zipper bag on the pantry shelf until I’m ready to assemble. Assembly is easily done the night before – just make sure you have room in the fridge. You know how the prep for those huge holiday meals can eat up the space. Another tip: roast turkeys need to rest after cooking for quite awhile. Like, up to an hour. So once the turkey comes out, all the sides, including this dressing, go into the oven. Makes life so much easier… and leaves time for a glass of wine in the meantime. So have a happy holiday and I hope you enjoy this one as much as generations of my family have over the years. This is the one I get asked about all the time. An herbaceous, earthy addition to any holiday meal. Place bread cubes on two baking sheets in a single layer. Bake for 1 hour or until bread is dried out but not browned. In a large skillet over medium heat, add 1 C unsalted butter, bay leaves, onions, celery, sage, salt, and pepper. Sauté until vegetables are translucent, approximately 10-12 minutes. 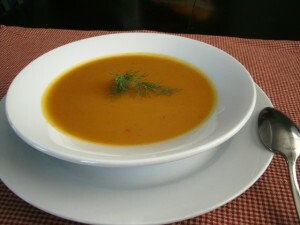 In a very large mixing bowl, combine dried bread cubes, sautéed vegetable mixture, and chicken stock. Let sit for 10 minutes and mix again. Let sit a second time if necessary until almost all of the chicken stock is absorbed. Add lightly beaten eggs and mix until thoroughly combined. Prepare a 13x9 inch baking pan with the remaining 2T of butter. Pour stuffing mixture into prepared baking pan. Place baking pan on a sheet tray and bake for approximately 1 hour, until stuffing is golden brown and firm to the touch. Let stand for 10 minutes before eating. You can make this the night before, store it in the fridge, and then bake it off while the roasted turkey rests. I also lay the cut bread cubes on a sheet tray overnight to dry out instead of drying them in a low oven. 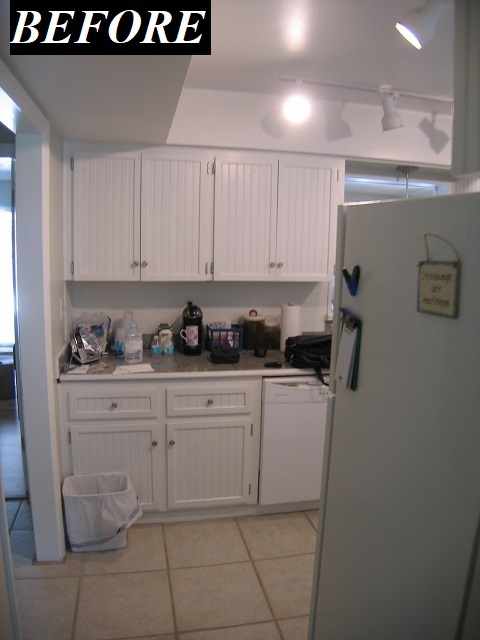 A recently widowed client’s decision to simplify her life included moving into a smaller home. 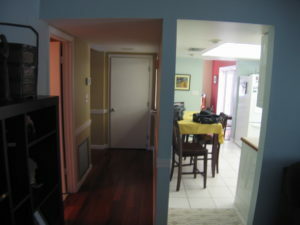 Like any new home, there were many projects to be completed. 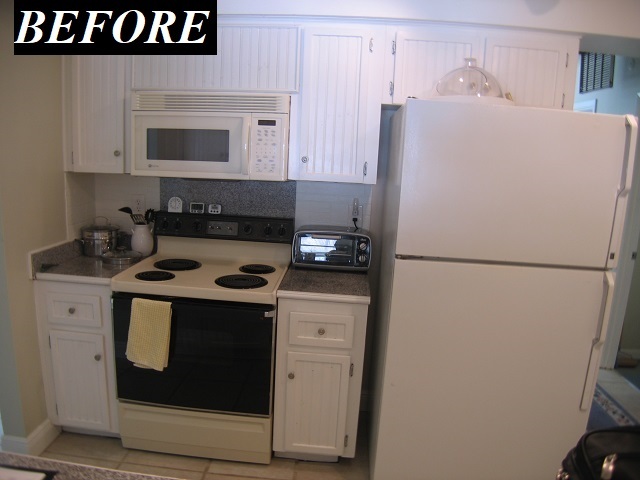 Hers included updating the kitchen she inherited upon moving in. As with many clients, her budget was limited. 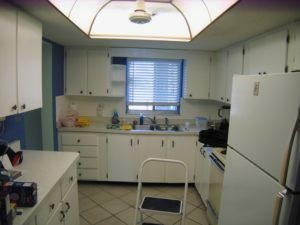 There were a few caveats from the beginning: 1) the existing beige floor tile running throughout the house and had to be maintained; 2) she needed storage space in the small kitchen; 3) she wanted warmth. 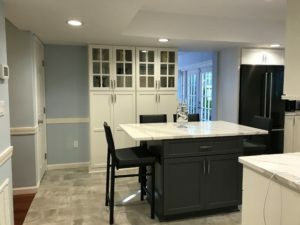 First off, working around the existing tile meant that no major changes to layout or walls could be made (a plus for the budget, a negative for storage), so we set about maximizing accessible storage for the client. Deep drawers occupy the majority of the under-counter storage, with a couple of roll out trays next to the fridge for flexibility. 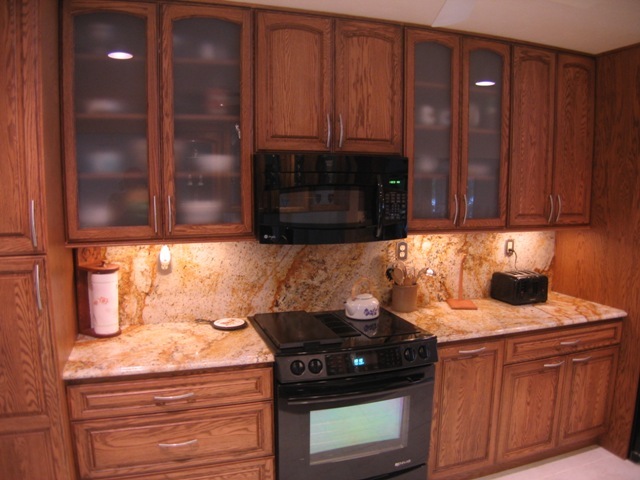 Upper cabinets with adjustable shelves round out the storage capacity. 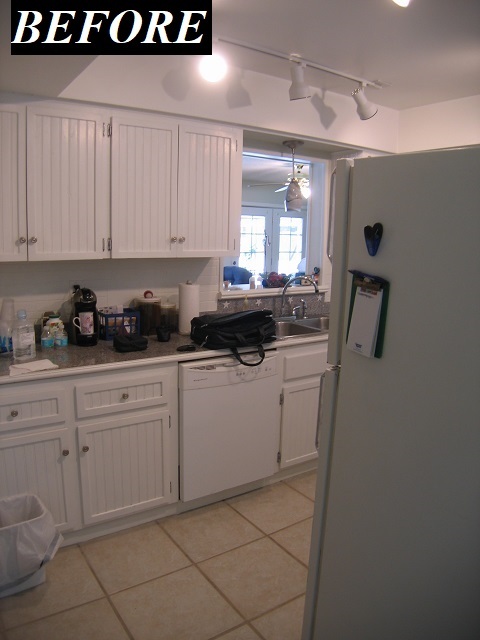 An extended conversation was had over the placement of a microwave: convenience of use vs. maximizing storage. Storage won out. 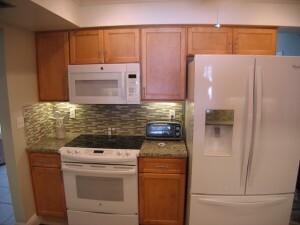 That decision meant the microwave was combined with the hood and placed above the cooktop. 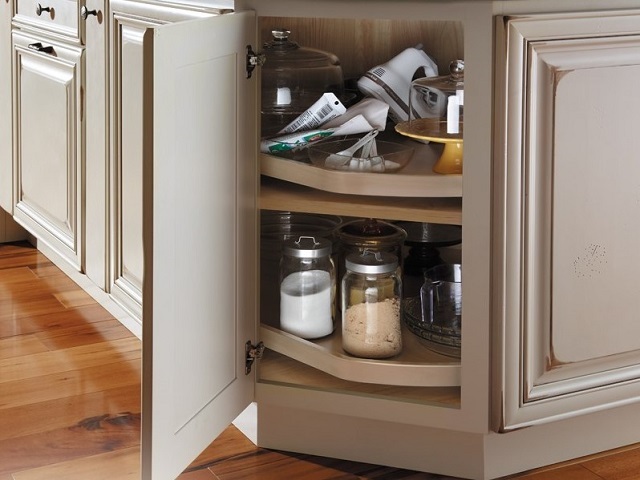 The addition of a pull out for trash, and ample tray/bakeware storage establishes a place for everything while still be conveniently accessed. 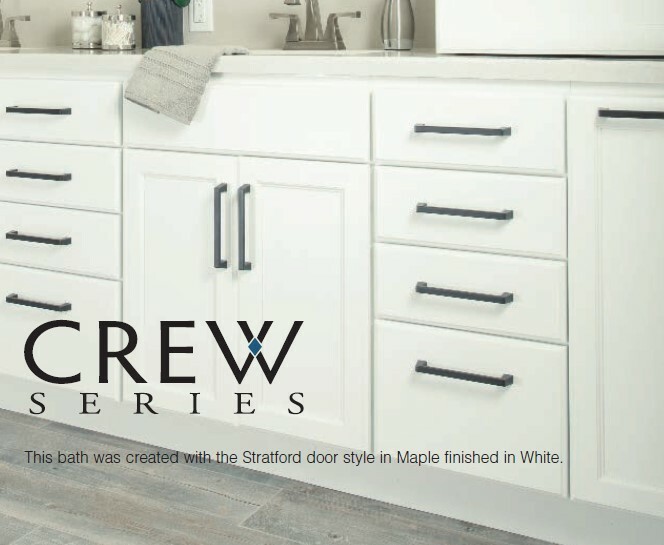 Choosing Crew Collection’s Maple Stratford doorstyle in Butterscotch stain ensured her budget would stretch as far as possible while still maintaining the hospitable style she desired. 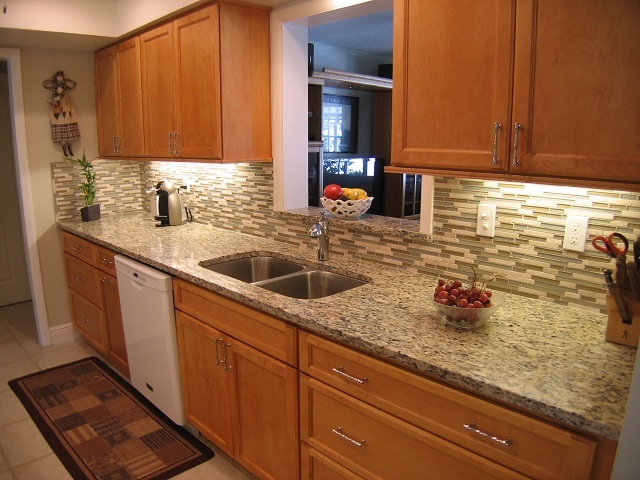 While engineered quartz countertops are all the rage now, they are not always the most budget-friendly of options. One way to get the most value out of your countertop budget while keeping with stone is to consider granite. 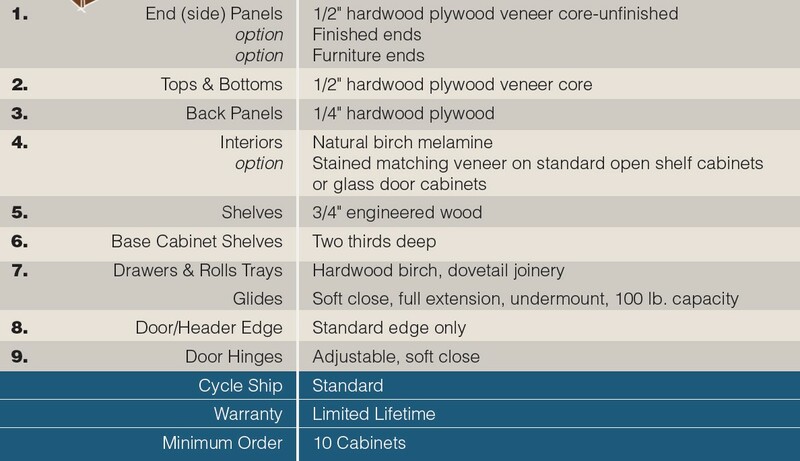 Engineered quartz pricing options seem to bunch in the upper-middle category, leaving very few economical choices. 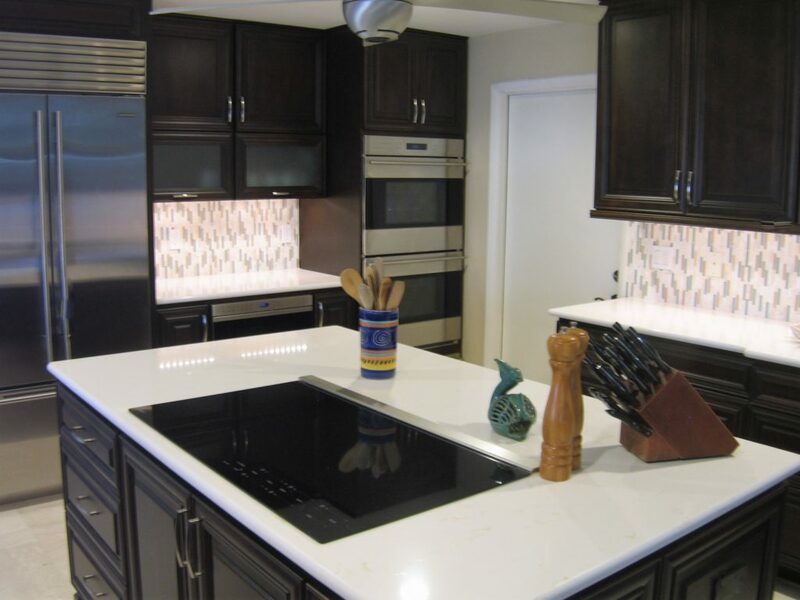 Natural stones like granite can more readily be found at competitive prices that maximize the value a client can receive. 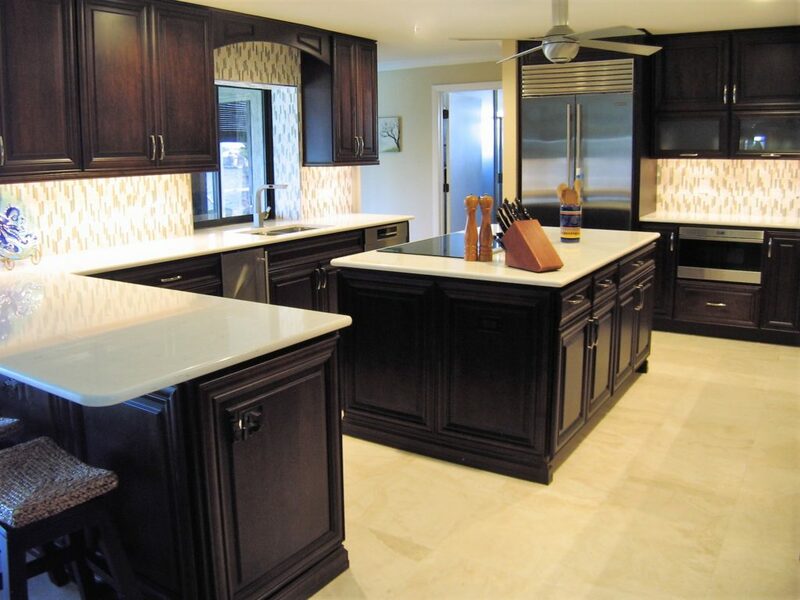 This homeowner chose to go that route, selecting a Santa Cecilia granite in earthy, brown tones, black accents, with flecks of garnet. 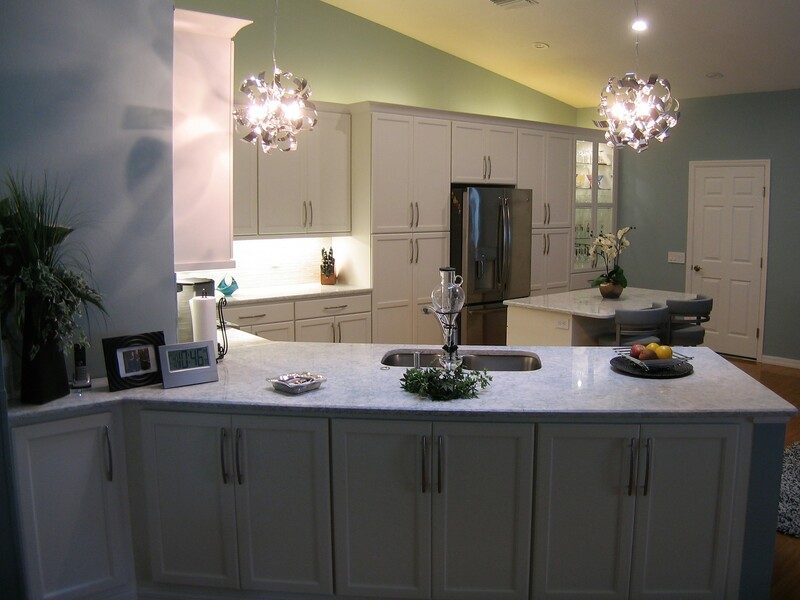 White appliances brighten things up while lending a casual softness to the narrow kitchen. A slide-in range was necessary here, opening up the short run of counter space. By removing the appliance splash and relocating the controls to the front edge of the cooktop, unnecessary visual bulk gave way to uninterrupted wall tile. This effect makes the cooking niche look as large as possible. 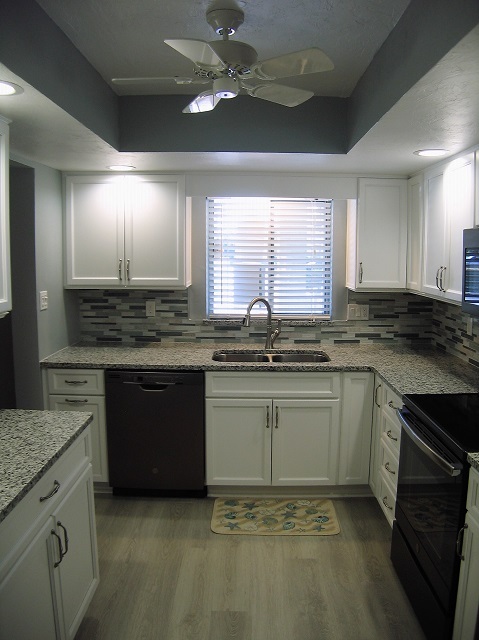 Eclipse Linear tile was the homeowner’s choice here. 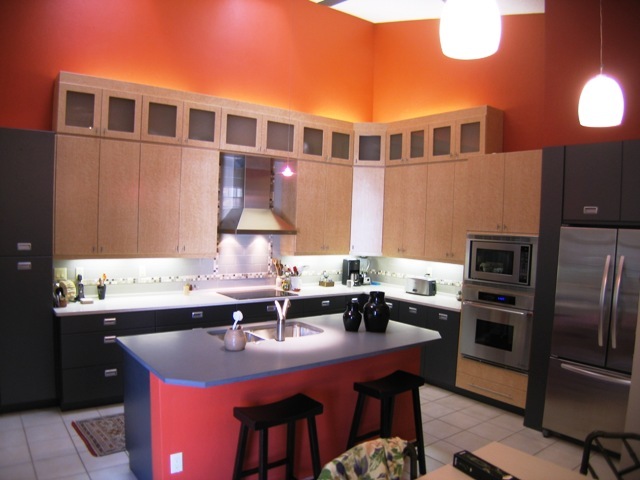 The mixed media tile comes in a variety of colors, with the Tranquility finish being used here. The subtly greyed blue and green glass tiles found in the backsplash are mixed with a tumbled stone punctuate the informality desired by the new homeowner. The term ‘budget friendly’ is always relative, but this homeowner’s new kitchen fit the bill perfectly. 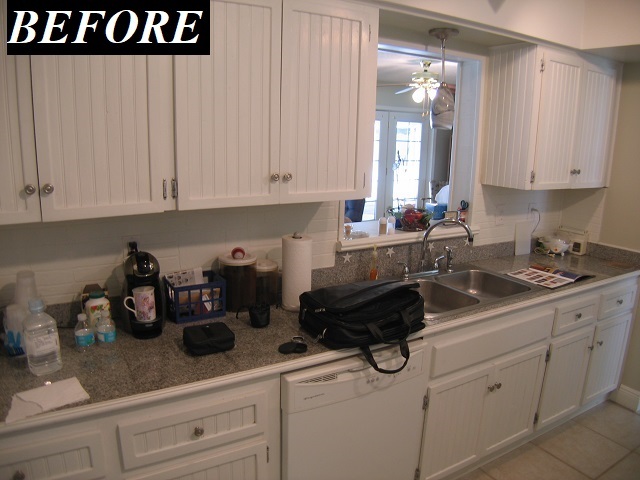 After many years in their home, this Braden Woods couple had updated everything except the kitchen. We helped them rectify that. 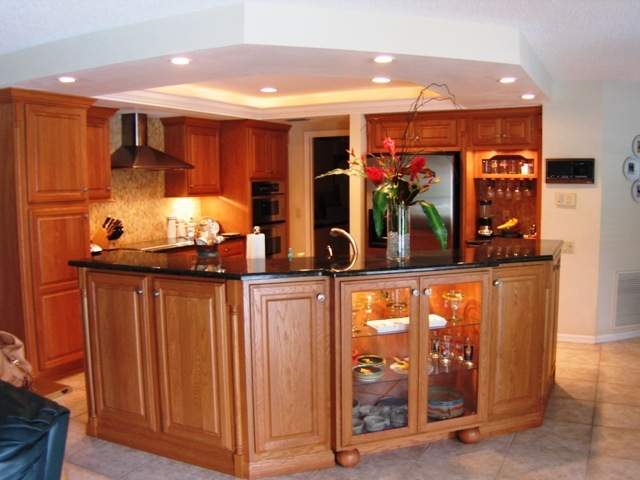 Over the years, warm wood tones had permeated the rest of the décor so it only made sense to carry that same feel into the rejuvenated kitchen area. The layout of the old kitchen made it seem small and confined. By simply removing the peninsula barrier, we were able to create more visual space and bring much needed natural lighting into the dining area. 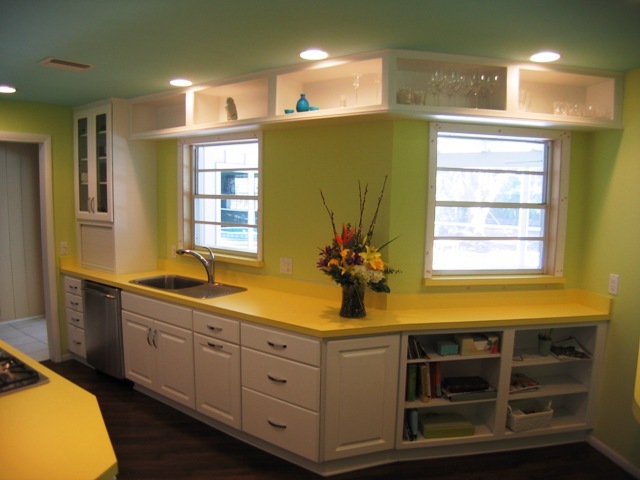 Raising the drop ceiling allowed for additional storage and magnified the formerly tight space even more. Desiring a focal point when looking in from the living area, the small wine rack doubles as both decoration and convenient storage. 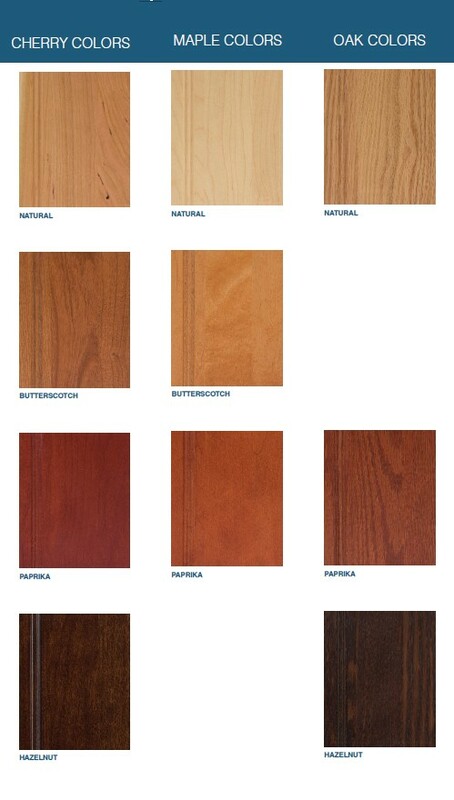 Selecting a raised panel cabinet in warm wood continued the classic comfort the homeowners had achieved with previous updates. 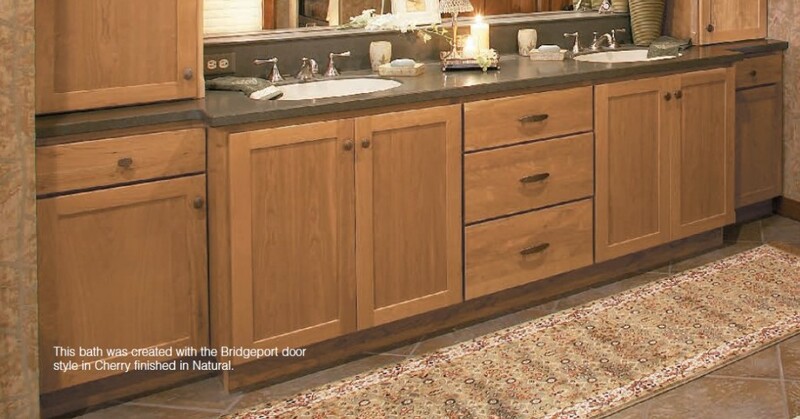 StarMark Cabinetry’s Alder Hanover doorstyle in Toffee stain was the only real contender in the homeowners’ eyes. Topped with Zanzibar granite, the subtle ruby-chocolate tones in both stone and wood were allowed highlight one another. 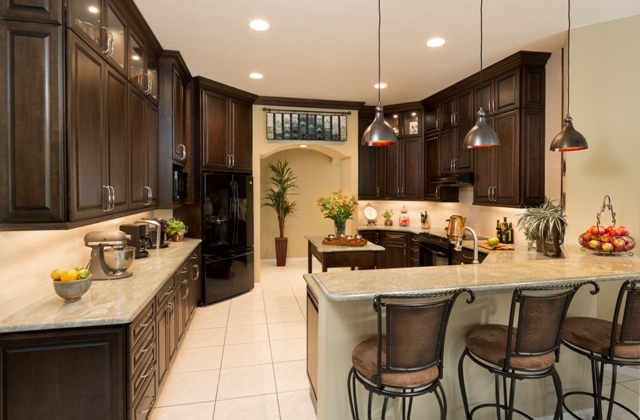 A simple 1×4 tri-toned ceramic tile splash reemphasized that chocolaty theme and gave the room a slight oomph. 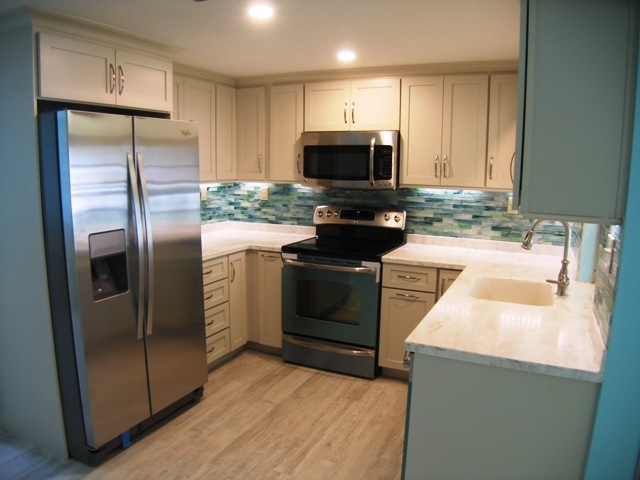 Timeless, stainless steel appliances from Samsung completed the subtle yet stylish look the homeowners were after. Now the kitchen is as current and comfortable as the rest of their home. Remodeling Partners: Cusano Construction Co.
It’s fall and that means it is tailgating time again! It’s not that I’m an enthusiastic football fan, but anytime food is involved, sports are better. Whether it’s Friday nights at the high school, Saturday afternoon college games, or hovering at the TV on Sunday afternoons for the pro teams, you gotta have the right eats to make it all better. I actually played with this recipe over the summer, and Don has been harping at me to get it up on the site ever since (he really just wants me to make it again). He’s a hot wings freak. I’m not a big fan of the hot sauce based kind, but I enjoy these because they have a more complex flavor. I also roasted these wings instead of deep frying them. I’m certainly not averse to deep fried goodness; I’m just too lazy to clean up the mess when it’s over. Besides, I can lie to myself and call them healthy this way. It’s a simple marinade – both in ingredients and assembly. There’s something about the combination of lemon and ginger that I love. I didn’t want an overt Asian bent to the flavor, but you could also switch out the salt for soy sauce and add a little toasted sesame oil to get yourself there. And it’s a total do-ahead too. I mixed it up the night before and made them for lunch on a weekend. 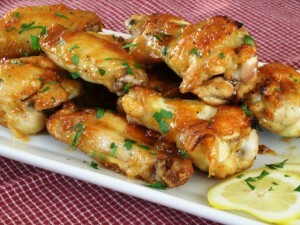 The best part is that the reduced marinade makes a phenomenal glaze on the roasted wings – a frugal bonus. This will also translate very well to other chicken pieces if you don’t want to make wings. And have you noticed how expensive chicken wings are? They are just as expensive as boneless chicken breasts at the local mega-store! Once in a blue moon they’ll go on sale for about 99 cents per pound, which is the only time I buy them. I just can’t bring myself to pay almost three bucks a pound for what used to be throw-away parts (damn the rising popularity of Buffalo wings). If you’re going to use other chicken parts, I’d recommend using the skin-on variety. You need that crunch factor you get from the roasted skin – my test of skinless chicken breasts felt like it was missing something. Besides, you aren’t deep-frying, so you need something to keep the chicken moist. I didn’t try these on the grill, but I think they’d do just fine. If you do decide to grill them, let me know how they turn out. So whether you’re a true-blue tailgater, a weekend fanatic, or a once-in-awhile enthusiast, add these wings, and you should be all set. Cut each chicken wing into 3 pieces: the drummette, the flat, and the tip. Discard the tips (or save them for stock). Place the drummettes and flats into a gallon-size, resealable plastic bag. In a mixing bowl, combine lemon zest, lemon juice, garlic, ginger, ground red pepper, salt, black pepper, and honey. Pour over chicken wings and ensure the marinade is thoroughly distributed. Seal the plastic bag, and place chicken into refrigerator for at least two hours (and up to overnight). Line a lipped sheet tray with heavy-duty foil. Lightly shake off excess marinade and place chicken parts in a single layer on foil-lined baking sheet. Roast chicken wings for 15 minutes. As the chicken wings roast, reduce marinade in saucepan over medium heat. Let marinade reduce by ¾, until it become a thick glaze. Remove from heat when it reaches desired consistency. After 15 minutes, turn wings over and return to oven for 10 minutes. 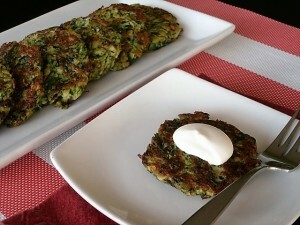 This post is reblogged from my earlier blog, “Inexpensive Eating”. It pays to plan ahead. I get mocked for it all the time, but I don’t care. Last weekend I spent the afternoon making pesto out of the abundance of basil that is all over the place this time of year. 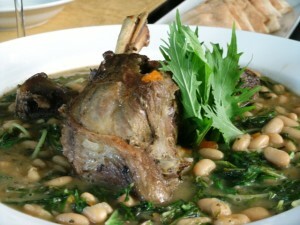 It’s quick, simple, fragrant, and delicious. Just 5 ingredients: basil, garlic, toasted nuts, parmesan cheese, and olive oil. I make it in the food processor, package it in handy-size containers, and stow it in the freezer for later. It’s amazing how often prepared pesto can get me out of a weeknight jam when there is only 20 minutes to make dinner before I have to run out the door for a client appointment, board meeting, or what have you. All these veggies pair nicely with pesto on their own, so I thought I might as well toss them all together. Same goes for the chicken. I seasoned the chicken breasts with just simple salt and pepper, instead of doing anything that would compete with the pesto. In an effort to add a little body to the sauce (which is really just pesto), I cook the orzo as I would a grain – a 2:1 ratio of liquid to orzo (when it’s finished cooking, it looks like a pot of rice). That way I can use all the starchy goodness that comes from the pasta when it cooks to give the sauce a little more heft. 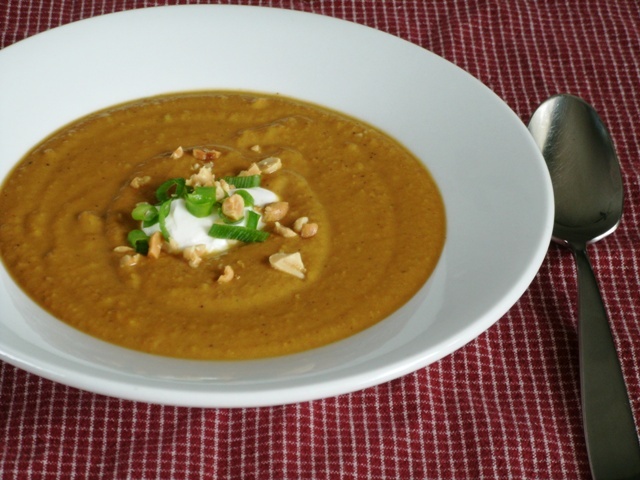 Cooking it in chicken stock just imparts that much more flavor. The only thing the recipe lacks is some crusty bread to go with it (which I happened to have on hand). I know this is short, but that’s all the time I have – I’m running back out the door. A healthy and great-tasting dinner you can have on the table in 20 minutes. Prepared pesto saves the day again. In a medium saucepan over medium heat, add chicken stock, orzo, and salt & pepper to taste. Simmer until al dente, stirring occasionally. Most of the liquid will be absorbed by the orzo. While orzo is simmering, preheat skillet over medium high heat. Season chicken breasts with salt & pepper. Add 1 T olive oil to skillet and sauté chicken 6-8 minutes per side. Remove from pan and allow to rest for 5 minutes before cutting. As chicken rests, add remaining olive oil to same pan and sauté asparagus for 4-5 minutes. In a large mixing bowl, combine grape tomatoes, corn, pesto, asparagus, and orzo (with remaining chicken stock). Toss to combine and check seasonings. 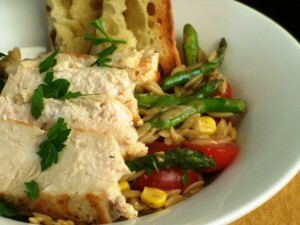 Slice chicken and serve atop orzo salad.